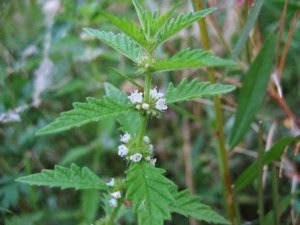 Although the common water horehound belongs to the mint family, its leaves do not have any aroma, whatsoever. This herb bears leaves having large curved teeth on their periphery and this alone differentiates the common water horehound from the other different species belonging to the genus Lycopus. Bugleweed can grow up to 2 feet in height. It blooms during the months of June, July, August and September, and bears fruit from August to October. The elongated leaves are purple in color initially and then turn green as they unfold. The flowers are small and white in color with purple spots, hermaphrodite and can self-fertilize. Bugleweed can grow on all soil types (sandy, loamy and clay) at varying soil pH levels. It needs a moist environment to develop, and can grow profusely in flooded soil. Bugleweed also has a long-standing reputation as a medicinal plant. Herbalists have traditionally used bugleweed as a sedative, to treat mild heart conditions, and to reduce fever and mucus production in flus and colds. More recently, bugleweed has been suggested as a treatment for hyperthyroidism and mastodynia (breast pain). Bugleweed is a natural source of phytochemical compounds, including various tannins; lithospermic acid; lycopine; flavonoid glycosides; phenolic derivatives such as caffeic acid, chlorogenic acid, ellagic acid and rosmarinic acid; essential oil; magnesium; and resin. Bugleweed’s medicinal properties are said to be due to the presence of lithospermic acid, as well as the other organic acids in the plant’s extract. Traditionally, the herb has been used to treat coughs, anxiety, fevers, palpitations, mildly overactive thyroid (as in Graves’ disease), to ease breast enlargement and tenderness in men, a sedative, and to control bleeding as in nosebleeds or heavy menstruation. It is also thought of as a natural remedy for sleeplessness. 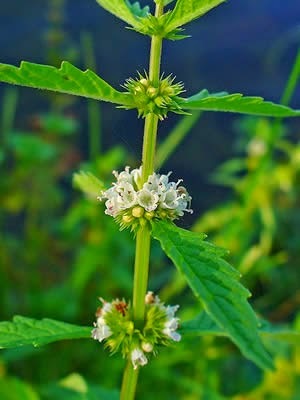 American bugleweed (Lycopus virginicus) and its European counterpart gypsywort (Lycopus europaeus) were widely used in folk medicine for and treating anxiety, tuberculosis and heart palpitations. Bugleweed is also taken for nervousness, insomnia, and to treat PMS (premenstrual syndrome). Bugleweed is used as an alternative treatment to hormone therapy. Components of the plant may lower the levels of the thyroid-stimulating hormone and thyroxine. This action could be due to the inhibitory effect of the herbal drug on the binding of the antibodies to the thyroid gland. Bugleweed is commonly used as a natural treatment for some symptoms of Grave’s disease, such as palpitations and convulsions. The herbal activity is sufficient for mild cases of the disease and is considered safe for long-term administration. A decoction prepared with the bugleweed flowers and leaves of the herb in wine and used internally helps to liquefy the condensed blood in people who sustain internal injuries due to a fall or by any other means. In fact, the decoction is extremely effective for treating all internal wounds, stabs or thrusts in the body or the bowels. Bugleweed extracts mainly affect the vascular tissues, as well as the sympathetic nervous system. Bugleweed is also an excellent remedy for treating all types of sores and ulcers, irrespective of the fact that they are new or old and chronic. The lotion is also useful for treating sores and ulcers that may occur in the private parts of both men as well as women. In the form of a pain relief medication, bugleweed extracts work excellently. This extract soothes the nerve reactions and, at the same time, it is an effective vasoconstrictor. Precisely speaking, bugleweed extract is useful in alleviating general pain and uneasiness. It also helps to lessen tension and get rid of irritability. Similar to other plants in the mint family, bugleweed is safe for use, provided it is used prudently. Taking bugleweed in excess of the recommended dosage may possibly result in a harmful decline in the functioning of the thyroid glands. Nevertheless, it has been found that using bugleweed for a prolonged period is safe for those with hyperthyroidism - both humans and animals. However, women should not use bugleweed during pregnancy. Even nursing mothers are advised to stay away from this herb. Use of bugleweed is also known to have some adverse side effects. For instance, this herb may bring down your blood sugar levels drastically. If people suffering from diabetes continue using bugleweed for an extended period, they may have low blood sugar. Therefore, it is necessary to closely monitor their blood sugar levels. In the case of some diabetic patients, their physicians may require adjusting the dosage of their medications. 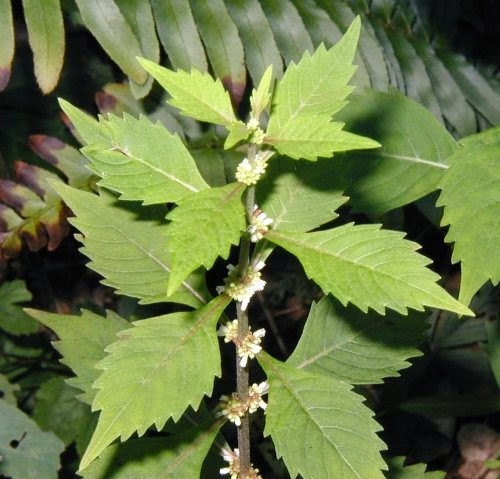 Prior to undergoing any surgery, you need to stop taking bugleweed, at least two weeks before the operation. People with hypo function, enlarged thyroid or receiving medications for thyroid should not use this herb.